These thermometers with their handsome holders are truly works of art. They make a stunning, unique, interesting gift for that person who has everything! 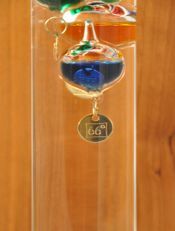 The Galileo Thermometer is a very unique thermometer that allows you to tell room temperatures (in degrees Fahrenheit) in a very attractive, unusual manner. The thermometer is a sealed glass tube containing a liquid and several glass spheres, each having a brass plate with a temperature inscribed on it. The brass plates provide different weights for the individual spheres so that as the density of the liquid in the tube changes with temperature change, each sphere will react to the density change by either sinking or floating in the tube. As the temperature goes up, the density of the fluid goes down and the spheres sink at a rate determined by their mass. As it goes down, the fluid density increases and they float, again dependent on their mass. Since each sphere is weighted differently (different mass), they will sink or float at different temperatures. In order to tell what the temperature is, simply look at the brass plate on the sphere at the bottom of the floating spheres. The temperature that is shown is the room temperature. As seen below, the room temperature for this thermometer was 66 degrees Fahrenheit. I presently have only one size available for sale, the large (18" tall glass) thermometer. In this one there are 10 spheres and the spheres have a 2 degree Fahrenheit difference from the others with a range in temperatures from 66°F to 84°F. Each thermometer is mounted in a handsome wall holder that I make of either Red Oak or Pennsylvania Black Cherry, your choice. I have engineered a convenient hole in the back of the holder that allows you to hang the unit from the wall. The easiest way to do this is to select the spot where you want it mounted and put one of the readily-available (at hardware stores, etc) plastic screw mounts into the wall and simply put a drywall screw into the wall. The drywall screw needs to protrude about ¼" from the wall surface so that its head can fit into the depression I have in the bottom of the hole in the holder. I do not supply either the mounting screw or the screw mount. The wooden wall holder will also sit well on a table in a protected area (you don't want to knock this over as the glass may break). Be sure to hang the thermometer away from a major heat source, as this will affect the temperature readings. Again, they are intended for indoor use only. Also, remember that these give you a close temperature reading. Their value is in their unique, interesting beautiful appearance not accuracy of temperature readings. They are wonderful conversation starters! Since many of you already have the Galileo Thermometer with no wall hanger but want a wall hanger for the unit, I offer the wooden wall hanger separately. Before you order, be sure to check that your thermometer will fit. Mine are made for the 18" tall thermometers (measured from the base to tip) with a diameter of 2". This is a standard size for these thermometers. I have these available for $48 plus my standard $5 shipping per order.